A pooh-pooh post and it's not even 7am! I know this book! It's one of my favourite children's books. Very cute! I know the german and english version. I remember this book when I use to read to my children. 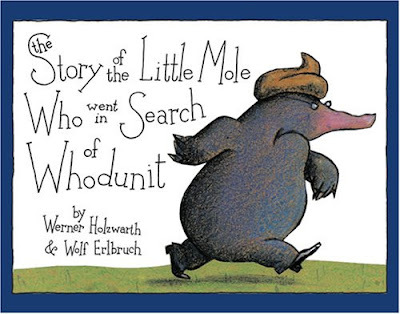 Who crapped on poor Mole's head? That is priceless and just how I feel today!! Sarah, how i have missed you on this month absence i have taken! Thanks i'm so proud of my self, i've wanted this job for like 2 years and FINALLY got it. AHAHAHA! Thanks for making me laugh this morning. I love translations! I'm so glad you found my blog so that I could find yours. Love it!! The books titles cracked me up! Can't wait to catch up on your adventures in France, a place I've always dreamed of visiting. My cousin studied abroad this past Spring, spent 6-weeks in Paris and said it was one of the most gorgeous places he's ever seen. Fingers crossed that I can get there someday soon! 1. Cackling with laughter like a mad woman right now. That book title made my day. 2. Why, prey tell, is your brother-in-law reading this particular book? In a bar??? Please explain. The French: telling it like it is. Oh. My. God. Now I must find this in Italian! "Il 'Mole' piccolo che vorrebbe sapere chi ha cagato sul capo?" I adore this book and my daughters too ! French is certainly the best concerning the tittle! Oh my goodness this is hilarious!! I love it! Haha. Dang. I'd be mad too. And what a theme for a children's book! 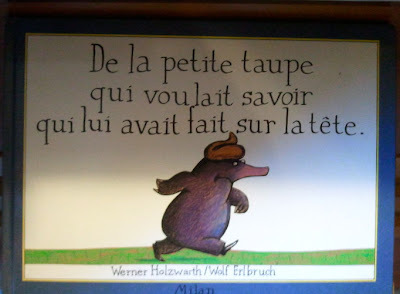 I find it interesting that my grandkids (2 through 4 years old) who I regret to say don't know French yet love the books equally when I read it to them in French or English. It's Bec's comment that sticks in my mind. I can understand (and can completely visualise) her... "cackling with laughter like a mad woman right now" but still wonder why her question has gone unanswered? 1). Why, prey tell, is your brother-in-law reading this particular book? 3). A mere week after his wedding?????? Before I die of terminal curiosity! 1) If you knew my brother-in-law you'd understand. It's the only answer I can give. He's like a 26 year old school boy. I just wish I had taken a photo of his smile when he was reading it. He was thoroughly enjoying it! Now go and pour yourself a pastis. Omigosh this just made my day! I wonder what "Goodnight Moon" is going to read like in French? How typical! Leave it to the French to not mess around with wordy, complicated titles. Cut to the chase...literally! Hilarious! I'm laughing out loud right now! That's so awesome. Thanks for sharing!